Bilbao, the largest city in the Pais Vasco and the capital of the province of Vizcaya (Basque: Bizkaia). A major seaport and industrial centre, the city is located on the river Nervión, and its suburbs extend to the Bay of Biscay. The city has recently undergone major urban renewal, in order to move away from the region’s industrial history and instead focus on tourism and services. A bubbling city with a good selection of hotels surrounded by beautiful countryside and high interest for visitors. As well as the famous Guggenheim Museum, the city acts as home for the Fine Art Museum (recognised as one of Spain’s finest art museums and recently refurbished) and the Maritime Museum on the Nervion’s banks, which recently hosted the RMS Titanic exhibition which has been touring Europe. These only represent a small portion of what the city has to offer. 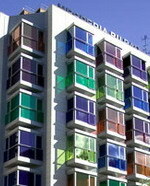 The Barceló Avenida Hotel & Spa is a deluxe hotel located 10 kilometers from Bilbao International Airport. The hotel is located in the upper part of the city, next to the Begona Basilica and just 10 minutes by metro from the center of Bilbao and the Guggenheim Museum. The onsite Sarasate Restaurant has a daily set menu, a la carte restaurant and buffet. The hotel has 11 rooms for meetings, conventions and receptions with capacity for up to 600 people. Coffee break facilities and state of the art audio-visual equipment is available. Barceló Avenida offers a wide range of facilities and features, such as: a Cyber Corner, WiFi access, ample parking, SPA and Fitness Centre. 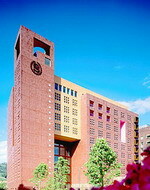 The hotel features 143 spacious rooms. Each guest room has a full bathroom fitted with a thermostatic bath and individual hairdryer, direct dial telephone, satellite TV with pay per view and video games. 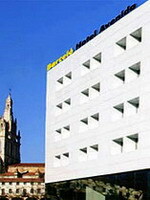 The Barceló Hotel Nervion in Bilbao is a nine-storey building located 200 metres from the main railway station and the nearest metro station. The world-renowned Guggenheim museum with innovative architecture from Frank Lloyd Wright is located 300 metres from the hotel. The beach on the north coast of Spain is 20 kilometres from the hotel. The hotel's restaurant, the Ibaizabal, is open at all meal times and serves a mix of traditional and modern cuisine, specializing in Basque and Italian food. At the Barceló Hotel Nervion, Bilbao, meeting rooms are also available in the hotel for business meetings or small private dinners. Audiovisual facilities are also available including videoconferencing equipment. Wireless Internet access is available throughout the hotel, for an extra fee. The hotel also has a gym and sauna, plus facilities for guests to relax with massage treatments. The Hesperia Bilbao is a seven-floor hotel featuring a striking, curved façade, and is set in a central location directly opposite the Guggenheim museum, within 50 metres of the city's shops and restaurants. A shopping centre is located adjacent to the hotel, and the world-renowned Guggenheim museum, with innovative modern architecture from Frank Gehry and Japanese architect, Isozaki, is 50 metres away. The hotel's main restaurant, La Ría, serves traditional Basque fare such as Bacalao (salt cod), lamb stew and chorizo. After dinner, guests are invited to relax in the Orilla Bar and enjoy drinks and cocktails. The hotel houses a number of conference and meeting rooms of varying sizes, all of which are equipped with modern audio-visual facilities for presentations. ireless Internet access is available free of charge in all public areas of the hotel. Multilingual staff at the 24-hour front desk are on hand to store valuables in the safety-deposit box, exchange currency and recommend places to visit in the city. Housed in a 20th century schoolhouse, Hesperia Zubialde hotel enjoys a riverside location in Bilbao, Spain. 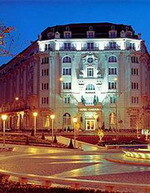 The hotel sits across from San Mames soccer stadium and Euskalduna Conference Centre. Guggenheim Museum, the famous Frank O. Gehry-designed center for modern art, is located one kilometer from the hotel, and the beach and Bilbao Airport are ten kilometers away. Hesperia Zubialde hotel's El Botxo restaurant presents a morning breakfast buffet and specializes in traditional Basque entrees for lunch and dinner. An array of wines are offered from the restaurant's exclusive wine cellar. Off the lobby, the Cafeteria eatery serves Spanish tapas and drinks. Moreover, the hotel's terrace features panoramic river views. Hesperia Zubialde hosts business and social events in its meeting and banquet facilities. Complimentary wireless Internet service is provided throughout the hotel. The Hotel Carlton in Bilbao, a beautiful, mansion hotel designed with chandeliers and marble flooring in its interior, located in the city center, 400 meters from the Guggenheim. Bilbao old town is within 500 meters of the hotel. The Hotel Carlton houses Artagan Restaurant, which serves traditional Basque cuisine and seafood; open for lunch and dinner. Guests can relax in the hotel fitness center which includes a well-equipped gym, steam room, sauna and a massage room. At the Hotel Carlton, Bilbao, other amenities include a multilingual concierge who can assist with sightseeing needs; valet parking, round the clock room service, and babysitting services. Events, wedding and banquet services are available on request. In the evening, guests can relax in the magnificent lounge bar decorated with domed ceilings, chandeliers, richly patterned rugs and marble floors; serves tapas and specialty cocktails from a house menu and is famed for its celebrity clientele. 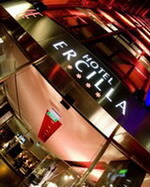 The Hotel Ercilla in Bilbao is located 12 kilometres from Loiu International Airport. Located in the heart of the business and commercial centre of the city, the hotel is close to Guggenheim Museum, the Euskalduna Congress Centre and the International Exhibition Centre. Its wide range of meeting rooms with the latest audio-visual equipment make it the ideal city-centre hotel for business. Your stay will be pleasant and comfortable, thanks to the richly appointed guest rooms. A complete buffet breakfast with a variety of salads, cured hams and sausage and a wide range of hot dishes surprise guests daily. The onsite Bermeo restaurant serves the best of traditional Basque cuisine. Elegant and impeccable service has made the Hotel Ercilla an ideal place for your business meals. The Hotel Ercilla Lopez de Haro is a luxury property located 11 kilometers from the Bilboa International Airport. 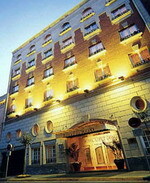 Opened in 1990, the Hotel Ercilla Lopez de Haro is in the center of Bilbao and exudes great luxury and elegance. 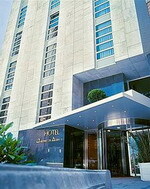 This hotel is only 100 meters from Guggenheim Museum and 500 meters from the Music Congress Palace. 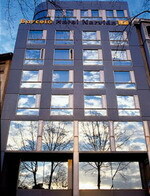 Providing easy access by highway, the hotel is near the train station and well connected to Sondica Airport. Experience the best of Basque cuisine in the onsite restaurant. The Club Nautico Restaurant, with its first-class china, cutlery and glassware, adds distinction and delight to the service elevating the Basque cuisine to new heights. Informal dining is also available at the Ambigu. The Hotel Ercilla Lopez de Haro is minutes to popular shopping and entertainment venues. The elegant and personalized décor in all the rooms and suites appeals to even the most discerning traveler. The Husa Jardines de Albia Hotel in Bilbao is set in the centre of this cosmopolitan city. It is a modern building with a grand marble and glass entrance set only 300 metres from the striking Gehry-designed Guggenheim Museum. The Husa Jardines de Albia has a spa tub and fully-equipped fitness centre. Business facilities include conference rooms, accommodating up to 100 people, and complimentary wireless Internet access throughout the hotel. Complimentary newspapers are available at the front desk, as are safe-deposit boxes to store valuables throughout your stay in Bilbao. Husa Jardines de Albia Hotel, Bilbao, offers The Zuria Restaurant and its menu of Basque dishes, served in a contemporary dining room. The cafeteria serves a breakfast buffet and room service. The modern Melia Hotel is situated in the centre of Bilbao on the banks of the Nervion River, next door to the Guggenheim Museum. The Guggenheim and Museum of Fine Arts are just 500 metres from the hotel and Bilbao old town and Santiago Cathedral are three kilometres away. Ereaga Beach is 12 kilometres from the hotel. The hotel's wood-panelled restaurant serves Basque dishes in a contemporary setting while the café, with it avant-garde decor, serves both international and Basque snacks. Guests can have a drink in the bar, read the free papers in the lobby and, in the summer months, relax on the terrace overlooking Doña Casilda Park. The sixth floor wellness centre has a heated outdoor swimming pool, gym and sauna as well as views of the river below. Families with children can make use of the hotel's babysitting service and for guests with business needs there are conference rooms and secretarial services. Multilingual staff are on hand at the 24-hour front desk and can advise on local sightseeing hotspots. Hotel Silken Indautxu rises from the financial district in Bilbao, Spain. Local attractions include the Fine Art Museum, Arriaga Theatre, and Guggenheim Museum, the famous Frank O. Gehry-designed center for modern art. 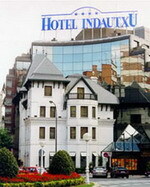 Hotel Silken Indautxu features several dining and refreshment options. Restaurante Etxaniz creates specialty Basque entrees with fresh local ingredients. The restaurant's dining space features hard wood flooring, linen-covered tables and a chandelier that extends from an expansive ceiling. Meanwhile, Cafeteria Indautxu offers expedient dining service, serving snacks and light lunches in a contemporary setting. Additionally, El Muelle Piano Bar presents live music and special weekend entertainment. The bar's overstuffed club chairs, arranged on hardwood flooring, invite relaxed conversations. Moreover, Hotel Silken Indautxu presents a morning breakfast buffet. Beyond its dining amenities, Hotel Silken Indautxu offers an on-site car rental and laundry center. The Guggenheim Museum Bilbao, in Spain, was built in 1997 by Frank Gehry, a Pritzker Prize winning Canadian/American Architect. Mr. Gehry is well known for his modern architecture, much of which seems to defy logic with its curves and bends. Unlike many architects, he completed construction of the museum on time and within the original budget. The curvatures of the museum were created using a combination of titanium, limestone and glass. The artwork protected from heat damage by the glass curtain walls that were built throughout the structure. The entire museum took three years to complete; it was started in October of 1994, and was first open to the public on October 19, 1997. Built beside the Nevion River, water reflects beautifully off the glass walls of the building that looks more like the sculptures it houses, rather than a functional museum. Even the entrance makes one commend the architect's vision in making the building an extension of the modern art inside. Buy at AllPosters.com Design of the Guggenheim was created using computers due to the mathematical complexity of each curve. 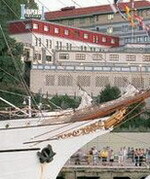 The resemblance of the museum to a ship was deliberate, due to the port status the town holds. If you look closely at the glass walls, you will note that they look like scales of a fish, and this fish design, which can be found in much of Gehry's work, is carried throughout the structure. Though the magnificence of the museum itself will leave you spellbound, do not forget the brilliance of the artwork within and on the grounds of the building. Many of the exhibits change periodically, giving visitors incentive to come often, though there are permanent exhibits as well. The museum is easy to navigate, which many be surprising considering the complexity of the exterior. Gehry's creativity can be seen inside the structure, as visitors enter the atrium. Gazing up, your eyes will be drawn to the skylight, which resembles a metal flower, allowing natural light to bathe the room. A canopy covered terrace, glass elevators, a sculptural tower, curving walkways, and stair turrets are also featured in the interior design. The hours spent exploring this modern museum will be well worth the visit. Not far from this impressive structure, still along the banks of the river, lies the Melia Bilbao Hotel. The hotel offers a variety of ways to relax, with an outdoor heated pool, sauna and fitness centre for your pleasure. The Café Chillida and Aizian Restaurant both serve Basque cuisine, designed to delight even the most discerning palette. Each room is equipped with modern conveniences, allowing you to enjoy your experience to the fullest. The Melia Bilbao Hotel is within easy access to Dona Casilda Park, where the Museum of Fine Arts resides, as well as the Euskalduna Conference and Concert Hall, making this the perfect choice to stay during your visit to Bilbao, Spain.